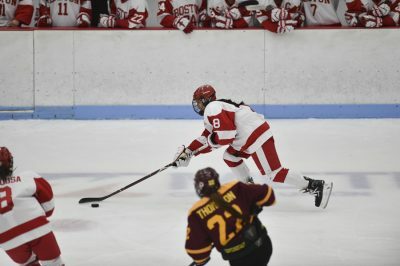 On a young team that added eight new players over the summer, the Boston University women’s hockey team has found its shutdown second liners in forwards freshmen Jesse Compher and Nara Elia and sophomore Deziray De Sousa. An injury bug led to the Terriers’ (13-15-6, 8-11-5 Hockey East) lines being shuffled throughout the 2017-18 season, but the De Sousa-Compher-Elia line has become a mainstay in this season’s play. BU head coach Brian Durocher noted that it took a little longer for the second line to fall into place than for the first line made up of senior forwards Victoria Bach, Rebecca Leslie and Nina Rodgers. As the tallest set of forwards, Durocher emphasized the line’s strength and size as a benefit to its play when it came to puck possession, which he noted is important in limiting the opposing team’s opportunities and shots. It is a role that has resonated with the players as well. The line has put up a combined 239 shots on goal, and have seen a fair share converted into points as well. De Sousa has scored two goals and earned six assists over the year, and generated four shots in the team’s most recent 2-0 win against the University of New Hampshire. Elia has notched eight goals and six assists in her inaugural season, and leads the line with 30 blocked shots. Over the course of the season, Compher has accumulated eight goals and 15 assists. Compher has also spent valuable time on the Terriers’ special teams, with her most recent goal coming on the power play against Harvard University in the Beanpot qualifying round, her sixth consecutive game with a point. Compher attributes a lot of her success to her line partners. While De Sousa has experience producing in collegiate playoff hockey from last year’s successful quarterfinal push, during which she put up an assist, Compher and Elia are no strangers to high-intensity games either. Before coming to BU, Compher won two gold medals with the U.S. Under-18 Team at the IIHF Women’s World Championship in 2016 and 2017. The Northbrook, Illinois native also competed for three consecutive national championships with the Chicago Mission U19 team and made three deep runs for the national title, including winning it in 2015. Across the ice, Elia took home a silver medal for Canada in the 2017 IIHF Women’s World U18 Championship, and has represented Saskatchewan in the National Women’s U18 Championship and the 2015 Esso Cup. Both freshmen put up points in the recent Beanpot tournament, as well, including an assist for Elia in the Terriers’ 4-3 overtime loss in the final to crosstown foe Boston College. 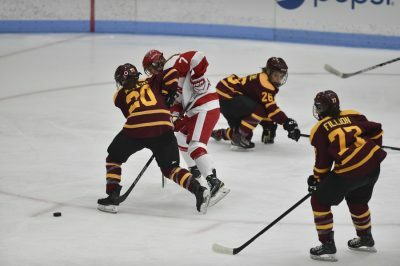 For them, the high-pressure games like those of the Beanpot serve as exciting opportunities. After ending the regular season with a sweep against UNH (14-13-7, 9-10-5 Hockey East), BU will be entering playoff hockey on a high note. The best-of-three series quarterfinals series for the Terriers will begin against the University of Maine this Friday, Feb. 23. BU has faced off against Maine (17-12-5, 11-9-4 Hockey East) three times throughout the season, and while not having won the previous matchups, the De Sousa-Compher-Elia line made for a total of seven points.